Ireland’s Leading Home Cinema & Automation Company. We have designed and installed home cinema systems in the North West of Ireland from fixed screens to dropdown screens with surround sound. Contact us today for a quote on +353 (87) 2250 599. Watch Apple TV or Netflix in HD Quality. We cater for all types of home cinema like a straight forward high definition flat screen TV with Blu-ray Surround Sound Package. Now with larger screen displays like 70” and 80” becoming more affordable it makes your system much more impressive. 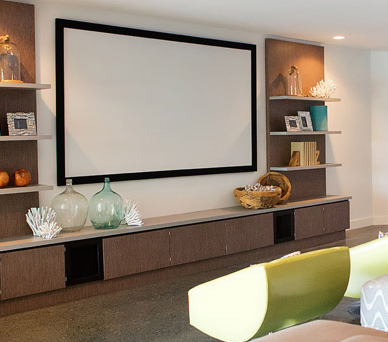 We can also provide a dedicated custom installation home cinema with a choice of fixed or automatic drop down screens, 3D 1080p HD Projectors and Surround Sound. If you are looking to install a home cinema system in your home, talk to Digitel today for a quotation. Signup for our BrochureWhere do we Install?